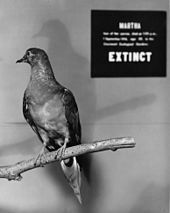 Martha (c. 1885 – September 1, 1914) was the last known living passenger pigeon (Ectopistes migratorius); she was named "Martha" in honor of the first First Lady Martha Washington. The history of the Cincinnati Zoo's passenger pigeons has been described by Arlie William Schorger in his monograph on the species as "hopelessly confused," and he also said that it is "difficult to find a more garbled history" than that of Martha. The generally accepted version is that, by the turn of the 20th century, the last known group of passenger pigeons was kept by Professor Charles Otis Whitman at the University of Chicago. Whitman originally acquired his passenger pigeons from David Whittaker of Wisconsin, who sent him six birds, two of which later bred and hatched Martha in about 1885. Martha was named in honor of Martha Washington. Whitman kept these pigeons to study their behavior, along with rock doves and Eurasian collared-doves. Whitman and the Cincinnati Zoo, recognizing the decline of the wild populations, attempted to consistently breed the surviving birds, including attempts at making a rock dove foster passenger pigeon eggs. These attempts were unsuccessful, and Whitman sent Martha to the Cincinnati Zoo in 1902. However, other sources argue that Martha was instead the descendant of three pairs of passenger pigeons purchased by the Cincinnati Zoo in 1877. Another source claimed that when the Cincinnati Zoo opened in 1875, it already had 22 birds in its collection. These sources claim that Martha was hatched at the Cincinnati Zoo in 1885, and that the passenger pigeons were originally kept not because of the rarity of the species, but to enable guests to have a closer look at a native species. By November 1907, Martha and her two male companions at the Cincinnati Zoo were the only known surviving passenger pigeons after four captive males in Milwaukee died during the winter. One of the Cincinnati males died in April 1909, followed by the remaining male on July 10, 1910. Martha soon became a celebrity due to her status as an endling, and offers of a $1000 reward for finding a mate for Martha brought even more visitors to see her. Several years before her death Martha suffered an apoplectic stroke, leaving her weakened; the zoo built a lower roost for her as she could no longer reach her old one. Martha died at 1 p.m. on September 1, 1914 of old age. Her body was found lifeless on her cage's floor. Depending on the source, Martha was between 17–29 years old at the time of her death, although 29 is the generally accepted figure. After her death, Martha was quickly brought to the Cincinnati Ice Company, where she was held by her feet and frozen into a 300-pound (140 kg) block of ice. She was then sent by express train to the Smithsonian, where she arrived on September 4, 1914, and was photographed. She had been molting when she died, and as such she was missing a few feathers, including some of her longer tail feathers. William Palmer skinned Martha while Nelson R. Wood mounted her skin. Her internal parts were dissected by Robert Wilson Shufeldt and are also preserved and kept by the National Museum of Natural History. From the 1920s through the early 1950s she was displayed in the National Museum of Natural History's Bird Hall, placed on a small branch fastened to a block of Styrofoam and paired with a male passenger pigeon that had been shot in Minnesota in 1873. She was then displayed as part of the Birds of the World exhibit that ran from 1956 to 1999. During this time she left the Smithsonian twice—in 1966 to be displayed at the Zoological Society of San Diego's Golden Jubilee Conservation Conference, and in June 1974 to the Cincinnati Zoo for the dedication of the Passenger Pigeon Memorial. When the Smithsonian shut down its Birds of the World exhibit, Martha was removed from display and kept in a special exhibit at the Cincinnati Zoo. Martha was back on display in the Smithsonian from June 2014 to September 2015 for the exhibit Once There Were Billions. Martha has become a symbol of the threat of extinction. She was used at the Zoological Society of San Diego's 1966 Golden Jubilee Conservation Conference as a mascot to emphasize the need for conservation. A Harvard historian has described Martha's remains as "an organic monument, biologically continuous with the living bird she commemorates, the embodiment of extinction itself." Many authors writing about extinction have made what one described as a "strange pilgrimage" to see her remains. John Herald, a bluegrass singer, wrote a song dedicated to Martha and the extinction of the passenger pigeon that he titled "Martha (Last of the Passenger Pigeons)". ^ Reeve, Simon (March 2001). "Going Down in History". Geographical. Campion Interactive Publishing. 73 (3): 60–64. ISSN 0016-741X. ^ a b Department of Vertebrate Zoology, National Museum of Natural History (March 2001). "The Passenger Pigeon". Encyclopedia Smithsonian. Smithsonian Institution. Retrieved 22 April 2013. ^ D'Elia, Jesse (November 2010). "Evolution of Avian Conservation Breeding with Insights for Addressing the Current Extinction Crisis". Journal of Fish and Wildlife Management. Fish and Wildlife Service. 1 (2): 189–210. doi:10.3996/062010-JFWM-017. ^ a b c "In 50 Years Passenger Pigeons Went From Billions To A Lone Bird, Martha". sportsillustrated.cnn.com. Sports Illustrated. Retrieved October 28, 2011. ^ a b c d e Shell, Hanna Rose (May 2004). "The Face of Extinction". Natural History. American Museum of Natural History. 113 (4): 72. ISSN 0028-0712. ^ "Last Passenger Pigeon Dies". El Paso Morning Times. El Paso, Texas. September 14, 1914. p. 5. ^ a b c d e Shufeldt, Robert W. (January 1915). "Anatomical and Other Notes on the Passenger Pigeon (Ectopistes migratorius) Lately Living in the Cincinnati Zoological Gardens" (PDF). The Auk. American Ornithologists' Union. 32 (1). Archived from the original (PDF) on 2014-05-20. 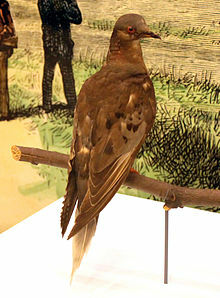 ^ a b c d e "'Martha,' The Last Passenger Pigeon". Celebrating 100 Years at the National Museum of Natural History. Smithsonian Institution. Retrieved 28 April 2013. ^ a b c Freedman, Eric (Autumn 2011). "Extinction is Forever". Earth Island Journal. Earth Island Institute. 26 (3): 46–49. ISSN 1041-0406. ^ "360 Degree View of Martha, the Last Passenger Pigeon". Retrieved 2 September 2014. ^ Herald, John. "Lyrics to 'Martha (Last of the Passenger Pigeons)'". Johnherald.com. Retrieved 28 April 2013. Burkhardt Jr., Richard W. (2005). Patterns of Behavior: Konrad Lorenz, Niko Tinbergen, and the Founding of Ethology. Chicago: University Of Chicago Press. ISBN 978-0226080901. Rothschild, Walter (1907). Extinct Birds (PDF). London: Hutchinson & Co.
Schorger, A. W. (1955). The Passenger Pigeon: Its Natural History and Extinction. Madison, WI: University of Wisconsin Press. ISBN 1-930665-96-2.